Electricity. It’s everywhere. Especially in your car. Think about it: there’s a battery, the battery has to start the car. The lights use electricity. The radio, the navigation system, the reverse camera all use electric power. There’s a computer that controls every facet of the engine operation of a modern automobile, and that’s powered by, you guessed it, electricity. Got nice stuff like heated seats and a heated steering wheel? Electric power makes it work. So what happens when all this electrical equipment starts acting up? In the worst case, you turn your key in the ignition, turn it and nothing happens. In less serious cases a light is out, or an accessory doesn’t work. Well, you can’t just look at a battery, light socket, or wire and see if there’s current flowing, can you? You need a tool to see what’s happening in your electrical system. A multimeter fits the bill. A multimeter in its most basic sense measures three different parameters of electric circuits: volts, amps, and ohms. Voltage is how much “pressure” is pushing on the circuit; amperage is how many electrons are actually flowing in the circuit, and ohms are how much resistance there is to the circuit. Most cars have 12 volt electrical systems (really around 13.8 volts when the car is running, don’t ask us why). Car batteries are rated by how many amps they can provide to turn the engine over. A straight piece of wire will present a low resistance to electric flow, or zero ohms; a light bulb will have a few ohms of resistance. Measuring these things at different points will tell you something if you have a problem. If your car won’t start, and the battery is only reading 9 volts, there’s an issue. If your alternator is only putting out 11 volts while the car is running, there’s a problem. We won’t go any deeper into the details of troubleshooting, but you get the idea. You can also check common flashlight batteries to see if they are good, check if your electric socket is working, all kinds of useful things around the house and garage. 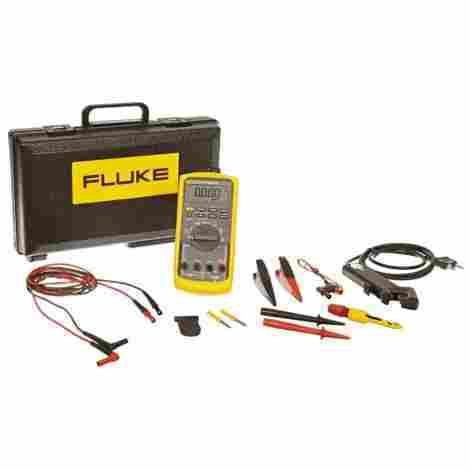 The Fluke 88 Automotive Multimeter Combo Kit contains everything you need to test almost any electrical value in any car, truck, SUV, or motorcycle, from battery voltage to millisecond pulse widths in high tech fuel injection systems. A complete set of probes and transducers accompany this multimeter in a good-looking case. The Fluke 88 Automotive Multimeter Combo Kit is IT. This is pro-grade gear (at a pro grade price...). If you want to be the best equipped mechanic on the block, though, this is it, the standard against which all others will be measured, the ne plus ultra of automotive multimeters. It's a champagne multimeter, at a champagne price, but it is, unquestionably, the best around. This is a classic multimeter that tests all the basics: volts, amps, ohms. It auto-ranges, meaning you don't have to tell it what scale you want, it will show it to you based on what you're measuring. It measures both AC and DC voltage. It has a built-in electronic thermometer, making it useful for many non-electronic tasks under the hood. It even includes an inductive pickup to measure RPM. What more could you ask for? Not much, we say. We'll be straight up honest with you: you're going to get a case of sticker shock when you look at the tag on this thing. But you are paying for the best, most complete kit we could find. And, it's a Fluke. Fluke has been in business for over 70 years, and features a worldwide sales and support network. We therefore like not only the sheer awesomeness of this kit, but the support behind it. It is simply the best there is. Need an auto-ranging digital multimeter with a 600V capability? The Klein MM400 is what you might need. The MM400 measures volts and amps, and includes a digital thermometer function. Batteries, test probes, and a thermocouple for temperature measurements are included. Klein has been making tools for industry since 1857. 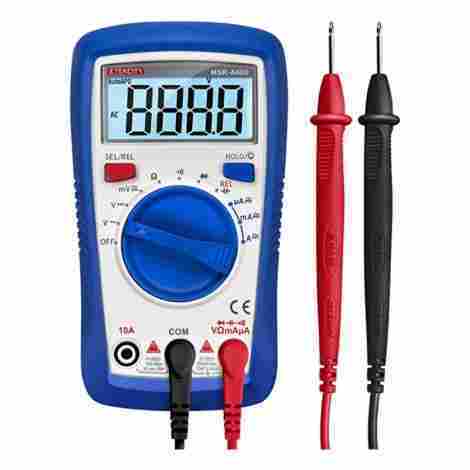 We're sure their experience shows in this attractive and capable multimeter. You'll be very pleased with the price-point of this high quality piece of test equipment, too. It's a tough, job-ready multimeter, drop tested to 3.3 feet, and cased in a safety orange high-impact case. The MM400 will measure temperatures from 0°-1000°F (-18°-538°C), in case you really want to know how hot that catalytic converter is getting! It's an easy fit in your toolbox, too, at only 10.6 ounces, and it requires only 2 AAA batteries to power it. You're a cool cat, and you'll be cooler than ever when you have a Klein multimeter at your side. 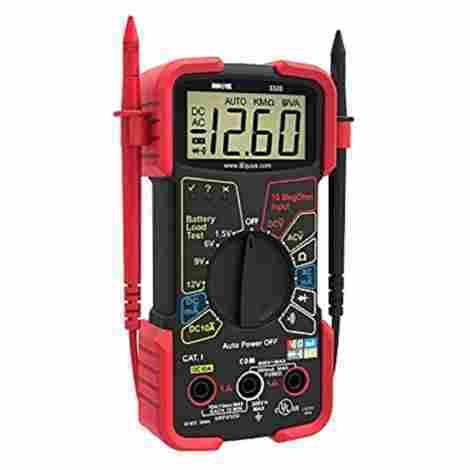 The Klein MM400 multimeter is a great bargain, coming as it does from a company with a long history, and strong customer service. It does much more than make simple measurements, also determining capacitance, frequency, and temperature. The MM400 will test continuity and diodes, for lots of added utility and value. For the asking price, it does everything you want, and more. Here's another Fluke product! With the Fluke reputation for quality and accuracy, it's no surprise that Fluke holds two of the top three positions on our list. The Fluke 101 is a small, no-frills but full accuracy basic multimeter. It's lightweight, takes only 2 AAA batteries, and still is Cat III safety-rated to 600 volts. Third on the top 10 best multimeters is another Fluke! 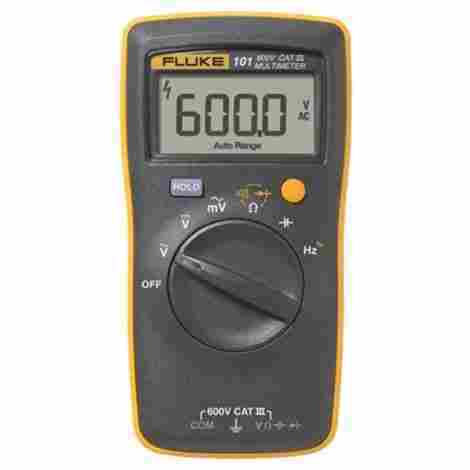 Fluke saw the need for a basic, lower-cost, all-around multimeter with the most used functions in a light weight, easy to use package. The 101 is it. We love its one-hand operation, with legendary Fluke accuracy, and Fluke customer service. Its automatic shutdown feature will preserve your battery life, seeing it ready for use at a moment's notice. Those moments will come often, because you will love this multimeter so much you will constantly be looking for excuses to use it. Though this is a smaller, lighter, and less expensive Fluke, nothing you need was left out. Voltage measurements to 600V, full ohm measurements, and up to 10 amps of current are the bread-and-butter functions of this multimeter. It checks capacitance, something not seen on more expensive equipment. The test leads you need to put it into play are included. This is a well-rounded multimeter, complete and ready to serve all your needs from garage to home. This meter is a little more expensive than average, but its quality will make you happy you spent the few extra dollars. This would even make a great gift for the mechanic in your life. We would not hesitate to purchase a Fluke 101 for ourselves or anyone else. The utility found in this fine multimeter will satisfy anyone, from tradesperson to shade-tree mechanic. 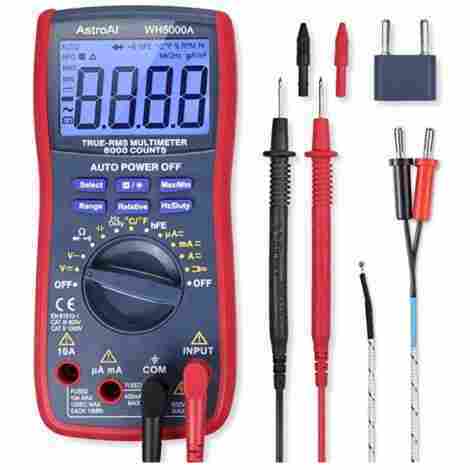 AstroAI's WH5000A brings you a full-function digital multimeter at a price that's nice. This a true RMS test device, yielding accurate measurements of AC circuits. All the other functions, from voltage to resistance, and including a digital thermometer, are at your fingertips. We like its versatility and robust design. The AstroAI WH5000A comes in your choice of case color, as long as it's red. A complete set of leads and probes is included, for measuring voltage, and resistance. A thermocouple for temperature measurements is also in the package. We liked the big backlit display and large rotary knob. You'll be safe and not sorry with the Cat III safety compliant to 600 volts AstroAI WH5000A. Accuracy plays a big part in its design, too; we loved the 0.8% accuracy of DC measurements to 600V. This little powerhouse will measure frequency as well, 0-60 Mhz to 1% accuracy. It's got you covered, no matter what you need. We found this multimeter to be a strong value leader, based on its capabilities and its price. This multimeter doesn't cost much more than stopping for fast food after the kid's baseball game. And unlike a cheeseburger, it will hold an honored spot in your toolbox for years to come. Don't hesitate to add it to your arsenal. Put an Etekcity MSR-R500 in your toolbox and you'll put a full-function multimeter to work for you. Measure voltage, resistance, and current, and see the results on a large, backlit display. Leads and a battery (1 x 9V) are included. You'll be pleased as punch with the price! The Etekcity MSR-R500, fifth on our list, does everything you need, comes in a sleek red case, and costs considerably less than a night at the movies. It performs all the usual multimeter tricks, and does them well. Volts, amps, ohms, we found all the functions easy to find on the simple rotary selector. We use these multimeters all over the garage and house. Batteries? You can check them with this meter. Socket working? Check with the AC volts function (always following good safety practices when working around energized electrical equipment). Is that extension cord good? Check with the continuity function. We like having one handy at all times. Wow! This multimeter is literally cheap enough to buy two, so you can have one wherever you need it. We like having some redundancy in our tools, just to save walking around looking for that one essential tool you need right away. We'll bet you don't have just one screwdriver on your workbench, and carry it all over the house. Why have just one of these handy tools? And if it functions well, all the better! We like the price point on this one a lot, can you tell? 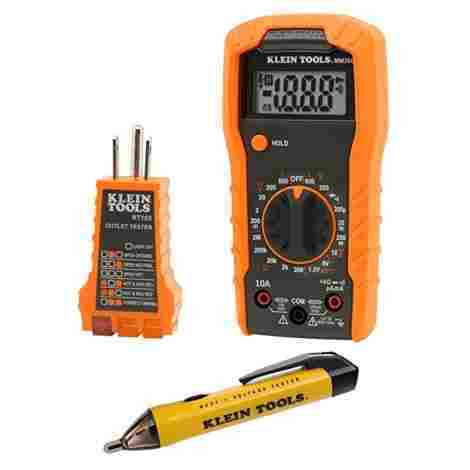 A complete kit from renowned manufacturer Klein, the 69149 set includes not just an MM300 multimeter, but a voltage detector and a receptacle tester, everything you need for home and shop electrical testing! We've all done it at one time or another: put your finger somewhere you shouldn't and feel the, uh, thrill of getting a little electric shock. At the best, annoying, at the worst, dangerous. 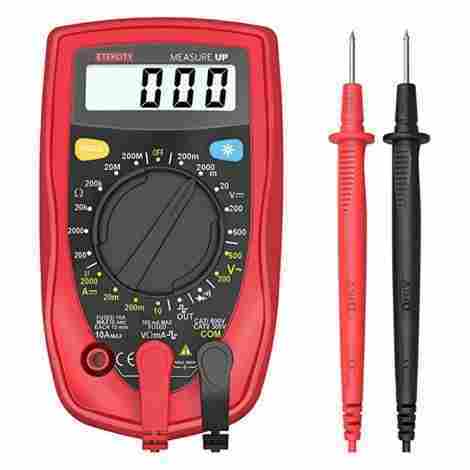 Well, the fifth entry on our list of multimeters, the Klein 69149 test kit, comes with not just a very handy and capable multimeter, but two, yes two, additional tools: a voltage detector and a receptacle tester. A voltage detector is a simple handy tool, working along the principle of "know before you go". If you are looking at a wire or a component that may or may not be hot, just put the Klein NCVT-1 voltage detector probe near it, and if the tester's red LED lights up, watch out! That circuit is hot! Great to confirm you have power where you want it, and none where you don't, safely without touching anything. The receptacle tester is just as handy for testing power plugs and extension cords. Plug it in, see which LEDs light up, match them to the guide printed right on the unit, and you'll quickly identify any problems. It's hard to argue with the great price of this tool, and getting three tools for what seems like the price of one. You won't need much else if you buy one of these. We were excited to see what's included, and we know these are quality tools that you'll have and use for years and years. Here's a handy, inexpensive multimeter that measures voltage, resistance, capacitance, and frequency. Test probes are included, including a handy second set with alligator clip ends for hands-free operation. The only thing it won't test is the limits of your bank account! Seventh on the list of best multimeters is the Neoteck 8233D pocket size digital multimeter. Well, they're all digital on our list, digital being easier to read that the old-school analog meters! You can still find analog multimeters out there, but digital is the way to go. Back in the day, most of these meters came in one color: industrial black. Now, the manufacturers are brightening up our lives with colorful cases and protective covers. This entry from Neoteck has a soft outer shell protective covering to guard against damage from being dropped or just banging around in your toolbox. The orange color helps it stand out and be found when you need it. Once you find it, you'll have a great tool in your hands, ready to measure most any electrical parameter you need. 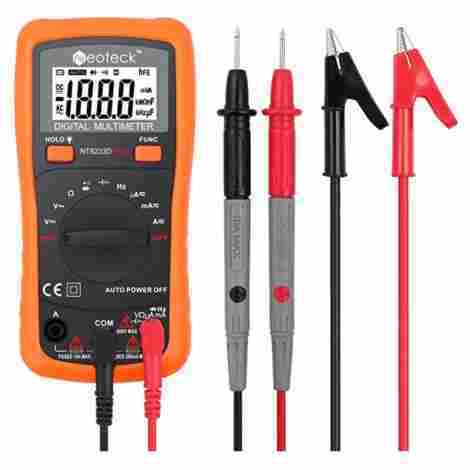 This Neoteck multimeter is a strong value leader, given its capability and excellent price, well below the mid-point of our pricing range. Little extras like a pop-out stand that let you place it at a 45-degree angle on your workbench give it the ease of use you love. The backlit display is useful in low-light conditions, or just for general readability. We rate this meter as an excellent value. 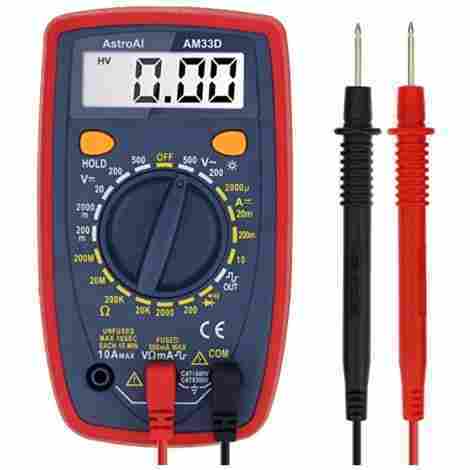 The AstroAI AM33D represents the bottom line in a multimeter that will do the job. No frills, no extras, no auto-ranging, but still with a data hold function and a backlit display. This multimeter is not out to impress anyone, just be competent at what it does. And we like competence just as much as you do! The AM33D from AstroAI holds eighth place on our list because it just quietly does its job, and won't cost you more than a cheeseburger and fries combo at the local greasy spoon. Though it's a bargain, it includes all the usual features: accurate measurements of volts, ohms, and amps. It's got a protective case with soft corners to shield it from the hard knocks of shop life. We have a to-the-point, no fooling' around multimeter here. For the inexpensive price of admission, you have to turn the range knob to the setting you need, it will not automatically select the range for you. We think that's an OK tradeoff. You'll probably find it sits on one range most of the time anyway, the DC 20V range. But the rest are all there if you need them! Cost is low on this entry, and because it works well, the value is high. The test leads and probes are included. If you are using one of these all day, every day, and making a lot of complex measurements, you might want a higher priced model, but if just the basics are all you need, this will get you where you need to be. The INNOVA 3320 is another in a line of multimeters that pack a lot of power in a small case (and a small price). An auto-ranging meter that performs all the tests on all the quantities you need, you'll be well pleased with both style and function. The unique built in clips to hold the probes handy is a nice touch. Even though this multimeter is pegged at number nine on our list, it is still a favorite around the Drivrzone garage. A unique-in-its-class case allows the probes to clip right to it, no untangling leads and dragging probes out of the bottom of your toolbox! We also love its quick LED go/no-go battery test function. The INNOVA 3320 will find a place in your home as well as your garage. Testing batteries, sockets, toys, games, anything you can think of, it will do it all and keep going. And it only needs one AAA battery (included in the package) to do it! Saving time and money is why we're here, and this is a fine example of how it can all come together in a useful, accurate tool. The INNOVA 3320 is in the lower price range of the multimeters we looked at. Even better, it works. It does what it says it will. That alone makes it worth the money. You can hardly get a pizza delivered for the price of this nice unit, so we rate it as a good value for the money. Here's another entry from Etekcity: the MSR-A600. Simple, but full-featured, the MSR-A600 has a backlit display, auto-ranging function, and includes a protective rubber sleeve. Simple and inexpensive it may be, but it includes the full functionality you want! Number 10 on our list of 10 best multimeters is the Etekcity MSR-A600. An auto-ranging digital multimeter that measures volts, amps, and ohms, it comes with probes and batteries included! As a bonus, it measures capacitance up to 2000 microfarads. The included blue rubber sleeve protects from wear and tear on the job. Other safety and convenience features include reverse polarity protection, low battery indication, and overload protection! Lesser multimeters will just go bzzzzzt! and quit working if you mistakenly exceed the range setting, but not this one. At the lower end of our price band, you'll be happy to see the tag on this model. All of its features for its price render it a good value. You'll be happy with what you get for your money, including a kickstand for bench use, and a battery-saving auto-cutoff feature. We liked it, and we're sure you will too. That completes the list of 10 best multimeters. You know you need one; you know you want one! We hope we’ve given you everything you need to know to make your choice. Isn’t that the fun part? 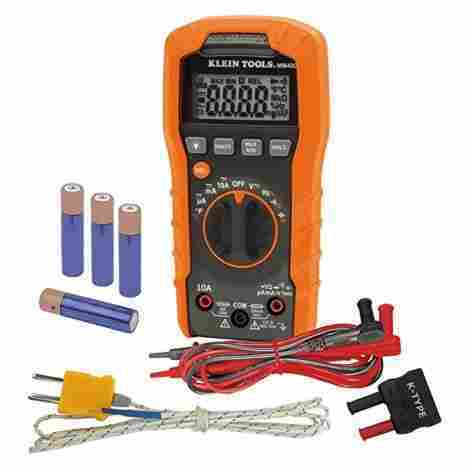 Opening the package and trying out your new multimeter will be even better. Let’s talk about how we came to our decisions now. It’s a digital world, and all of our choices for the best multimeters are no exception. Analog meters are still out there, and they were the state of the art… in about 1980. Digital means you get fast, easy to read, unambiguous readings of volts, or amps, or whatever you’re measuring. There’s no room for error when you go digital. That’s why it’s the modern standard, and why we choose digital every time. You don’t use a rotary phone anymore (if you ever did), why use an analog multimeter? These digital multimeters are the standard in the field, and we bring the best to you, just like the title says. A large, easily read, and backlit display won our vote every time. One or two of our entries at the lower end of the scale omitted a backlit display, but, take a look at the pictures, all of the multimeters have large digits in the primary display. When you are working on a vehicle or even on household wiring, you may not be in the most comfortable, easy position. A multimeter that can but a few feet away, yet still read easily is a big help in tight quarters. We like the large digits, and even better, with a backlit display. We don’t think any on our list is too small or too hard to read. That’s one reason we are placing them on the list! Home, home on the range! Where the ohms and the amperes play. What is autoranging and why do you need it? We’ll tell you! Each value you measure has a range. For example, the Klein MM300 does not auto-range. To measure DC volts, you select one of several ranges: 200mV, 2V, 20V, 200V, or 600V. If you’re measuring a 1.5V battery, you’d select the 2V range. A 120V household socket, select 200V. You get our drift. If you select the wrong range, the meter will either give you no reading, or one on a scale too small to read (most modern multimeters have overload protection, which means you shouldn’t blow it up if you select the wrong scale). Auto-ranging saves you time and effort by automatically showing you the value you want on a reasonable scale. Modern automation working for you! We rated versatile multimeters higher on our list. Essentially, that means the more functions, the merrier. A basic multimeter is fine, but throwing in lots of extra functions makes it a better value and impresses us more. Some things that were unheard of a few years ago are now commonplace. Capacitance measures and frequency counting are examples. Those functions used to take expensive stand-alone equipment to use. Now there it is, on some of the least expensive meters. A simple go/no-go battery tester is another example. We love those extra functions that make our life a little easier. Safety is always an important factor, and all the more when you are dealing with electric power. There are industry standards, such as CAT II and CAT III safety ratings; most of the multimeters on our list are CAT III approved to 600V. Some go on to CAT II ratings at 1000V. Most multimeters are also UL or CE listed. You can be sure that using these products will not place you at risk of injury. As always, we recommend you read the instructions before using any tool! These multimeters are all pretty intuitive, though, and certainly safe. Just like you, when we go shopping we have a budget. Who doesn’t? That means we want the best product for our money. All the factors that go into our decision affect the ratings we give. We love less expensive items that do their job well. We love the silky, sleek feeling of the top-of-the-line, too, but we can’t always afford it. That’s why we strive to give you a range of choices on all of our lists. We keep an eye out for tools and other accessories that are generally useful around the house, not necessarily just in the car or garage. A multimeter is an item that will provide good general service, testing batteries, checking sockets and light bulbs, and a number of uses. There are very specialized (and very expensive) automobile service meters that are not generally useful. We are not recommending those for the average consumer. We are looking for things that fit in more than one niche in your life, making them an even stronger value. As we mentioned above, more ranges equal more utility. The capability of measuring more parameters is a big plus in whatever type of multimeter you are considering. Think about the many values there are to measure: voltage, resistance, current, capacitance, frequency, continuity. Those are all things that can be measured accurately by a handheld multimeter. If it will do more for you, it’s worth more to you. We love that! We are here to help you be happier and make better, more informed decisions. This is a bit of rarefied air, but a true RMS multimeter is just a lot more accurate measuring AC voltages. “RMS” means root-mean-square. Oh no, they’re talking math! Yep. Only for a second though. RMS AC voltage values tell electricians and engineers things they need to know about how much power equivalent to DC voltage is being provided. OK, enough of that talk. If you need true RMS values, you probably know it and will be shopping for a multimeter that will provide them to you. And we have them on our list, built in, no extra charge! Q: Are they battery operated? A: Yes! You might just think that since you are connecting them to electricity, that would be enough to power them. Not so. Most contain a tiny microprocessor, and that little computer needs to be running for the multimeter to operate correctly. So yes, there will be a battery in them. Some use 1 AAA, some use 2 AAAs, and some use a 9V. Whichever it is, they’ll all have a battery. Some are easy to replace when the time comes; others may need a small screwdriver to open the back of the case. Check your owner’s manual for the correct procedure. Q: Can I use it with any car or just specific models? A: You’ll find a multimeter handy for any car, they are not specific in any way. They are handy for working on your car, light truck, SUV, motorcycle, ATV, boat, airplane… the list goes on and on. One multimeter will meet all your needs for all your projects. That includes the house projects, too! Wiring, installing new equipment, any task you can dream up involving electricity, your multimeter will be there for you. Q: Are these multimeters waterproof? A: Probably not, but check the manufacturer’s specifications. It’s never a good idea to use electrical equipment around water anyway. We think you might have a bad experience if you did! Q: Are these multimeters all handheld? A: Almost by definition, a digital multimeter is a handheld device. Way back in the day, there used to be big bench mounted multimeters in electronics shops. Way, way back we had VTVMs: Vacuum Tube Volt Meters. Now there’s some ancient technology! Those old dinosaurs have been almost 100% replaced with the modern, solid-state digital multimeter. And that, my friends, is a good thing for all of us, placing accuracy and versatility right in your hand, right on your job site!